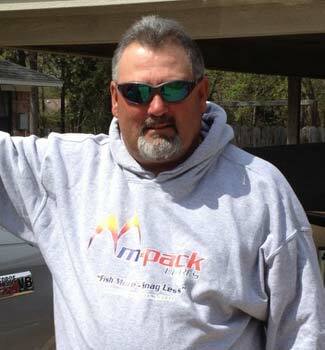 M-Pack Lures is committed to bringing high quality baits with innovative designs to the market. Our founder Mark Pack, an Elite Series and FLW Tour pro has been designing baits for over 25 years. His creativity is born out of the mind of a fisherman and a passion for the sport at all levels. We are excited to introduce our line of Structure Guard™ lures. A revolution in open hook baits is underway. Structure Guard™ is a vast improvement over the age old brush guard and has numerous applications beyond just jigs and guards against more than just brush. We all know fish relate to prey and structure. The M-Pack line of lures will take you into and out of any structure whether it be brush piles, rocks, boat docks, trees, cables, pads or any types of standing grass. The super weed less design allows you to Fish More and Snag Less. We hope it allows you to catch more fish as well! What about the hook up? Yes, this is a common question. The Structure Guard™ rolls down 180 ̊once a fish bites or hits the lure enabling a full hook set. It also applies back pressure on the fish’s mouth in order for the hook up to stay pinned. It was pro invented and has been pro tested. We did not stop with just a patented design. Careful attention has been taken with the selection of top quality components that are assembled around the Structure Guard™. Our hooks, color schemes, head designs, shapes and keepers were chosen with the avid angler in mind. M-Pack Lures provides you, the angler, an opportunity to maximize your time on the water and less time depositing baits in the lake. Should you be fishing for enjoyment, a side bet against a buddy or a tournament check we hope you will join the Changing of the Guard.